Your commercial hardscaping will need some basic maintenance to keep it looking good for years to come. Commercial hardscaping is often the first thing that customers or visitors see when they arrive at a store or facility. Therefore, having a beautifully designed hardscape is important for communicating the style and sense of quality of your brand. No matter what kind of hardscaping your commercial property employs, from pavers to concrete, it will end up being affected by stains, wear and tear, and changes in the weather. Basic, regular maintenance will be required in order to extend its longevity and keep it looking good. Here are three maintenance tips you should employ in your commercial hardscaping. Hardscaping, just like all of the other parts of your commercial landscape, will need to be checked out regularly. Individual pavers, rocks, or bricks can be displaced by settling ground, tree root growth, and other natural causes. By having a plan in place to inspect your hardscaping on a regular basis, you can catch these problems and address them before they lead to larger problems. Hardscaping should be cleaned at least once a year to maintain its longevity. 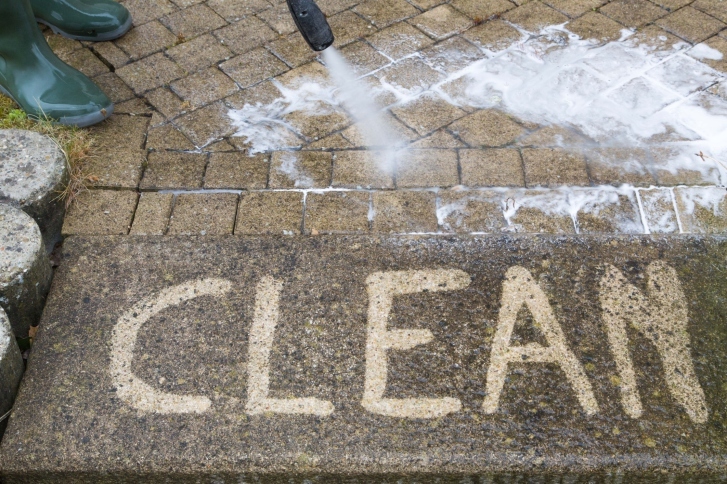 Schedule regular cleanings with a professional landscaping company such as Atlantic Maintenance Group, who will use commercial power washers to clean away the sediment that can collect over time from rain, snow, and falling leaves. In addition, you’ll need to have a weed removal service come out more frequently (usually once a week) to maintain a clean, uniform, and professional appearance. Depending on the age and material of your commercial hardscaping, you might require an annual sealing to help extend its longevity. This sealant protects against future staining and sediment buildup and adds a matte or sheen-like finish. If your company is utilizing an outdoor space as a place for employees to gather, this is a critically important move to preserving the beauty of your hardscape since employee outdoor areas tend to pick up regular staining. Expert advice, installation, and care is a key factor in maintaining the integrity of your property year-round. Atlantic Maintenance Group offers quality landscape, asphalt, snow removal and concrete maintenance services. We have the expertise to help meet all of your needs. Click here for a free quote today, give us a call at 410-768-4720 or contact us via our website to start planning for your maintenance needs. You can also follow us on Facebook, Twitter, Pinterest, and Google+. This entry was posted on Friday, April 7th, 2017	at 3:44 pm	and is filed under Curb Appeal	. You can follow any responses to this entry through the RSS 2.0	feed. Both comments and pings are currently closed.